This frostpress.com page contains a collection of the best non-profit wordpress themes. If you are representing a church you may want to check out our church category page. There are many premium Wordpress themes built specifically for churches that we’ve gone through and reviewed. The themes on this page are suited for all types of organizations including: Charities, NGO (non government organization), foundations, churches, political organization & more. All themes have been reviewed in 2014 and are tested to be highly responsive to look great regardless of what device a visitors chooses to visit your site from. Check out our details reviews for more information and sample sites with each theme. 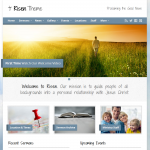 One of the most purchased church based wordpress themes. Easy to use with a one click install.